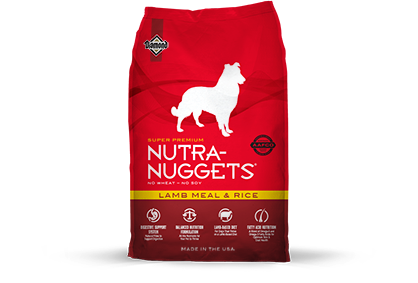 Nutra-Nuggets Lamb Meal & Rice Formula is ideal for moderately active dogs who prefer the taste of lamb or who may have sensitivities to chicken or corn. Rich in lamb protein, this formula is supplemented with glucosamine and chondroitin for healthy joints, and formulated with the proper balance of omega fatty acids to promote overall health and a beautiful, shiny coat. Lamb meal (21%), brewers rice (15%), brown rice, maize gluten meal, oat flakes, chicken fat, dried plain beet pulp, egg derivatives, fish meal, linseed, chicken digest, glucosamine hydrochloride (0.03%) and chondroitin sulphate (0.01%). Nutra-Nuggets Lamb Meal & Rice Formula for Dogs is formulated to meet the nutritional levels established by the AAFCO Dog Food Nutrient Profiles for maintenance.